On Tuesday, July 26, 2016 at 7:00 P.M., I will be presenting: 19th Century Immigration from European countries to the U.S. at the Austin Genealogical Society at Highland Park Baptist Church, 5206 Balcones Dr, Austin, TX 78731. I always enjoy visiting the Capital of Texas. Having grown up in Sacramento, I have a strong affinity for capital cities. The immigration topic is also close to my heart. My paternal grandfather immigrated to the U.S. on the S.S. Friedrich der Grosse sailing from Palermo 18 March 1911 and arrived at the Port of New York on 31 March 1911. Fourteen nights in the steerage compartment must have been quite an ordeal for a four year old child traveling with his mother, his older sister and his younger brother. My Sicilian great grandfather had been across the sea several times prior to making the decision to bring his family across the Atlantic Ocean to reside with him in Omaha, Nebraska. A colony of worker bees from the Sicilian hill towns of Carlentini and Lentini had formed in Omaha. The construction, railroad and meat packing industries of Iowa and Nebraska needed cheap labor. Sicilians and most other immigrants traveled together in small kinship groups of friends, neighbors and family. 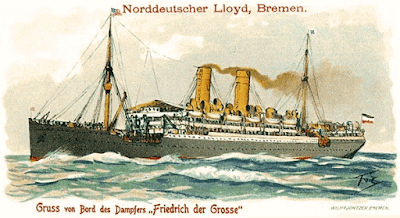 SS Friedrich der Grosse; built in 1896 by Vulcan, Stettin. Regularly sailed Atlantic routes from Germany and sometimes Italy to the United States and on the post run to Australia. Seized by the US in 1917, converted to a troop transport, renamed USS Huron (ID-1408). Went on to carry almost 21,000 men to France during the hostilities, and returned over 22,000 healthy and wounded men after the Armistice. This lecture will include case studies on how to find the greatest possible information from immigration records. My paternal grandmother's ancestors came to the U.S. from Liverpool in 1837. James McCrory was born in Ireland in 1814 but worked as a tailor probably in Manchester in County Lancashire prior to his marriage there in 1834. His wife was Sarah Lee, the daughter of an innkeeper from Newton le Willows. James and Sarah McCrory were found together on a passenger list immigrating from Liverpool in 1837. A portion of the passenger list which shows James and Sarah McRory (AKA McCrory) immigrating from England. There is no image available for the George Washington in the Passenger Ships and Image Database at Ancestry.com. The passenger list was only one page and contained 63 passengers. The ship must not have been very large. 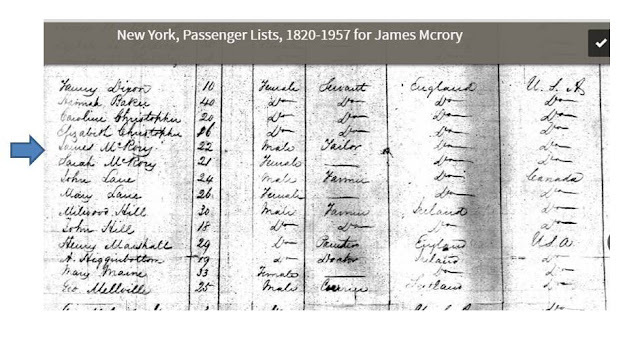 You can browse the database at Ancestry.com entitled "New York, Passenger Lists, 1820-1957" for the date of arrival. There were four other ships that arrived in New York on 28 August 1837: Harriet, Mediator, Southerner and St. Helena. 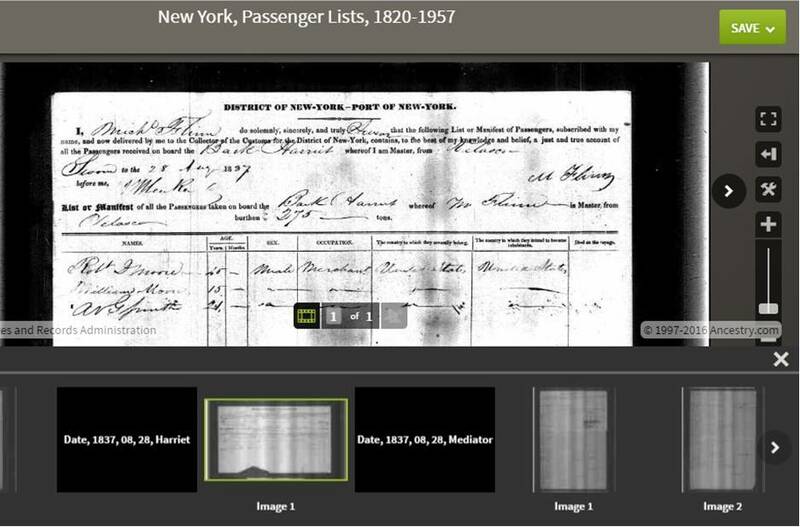 The filmstrip view at Ancestry.com is helpful for browsing these passenger lists as it shows the name of the ship and the date of arrival. This filmstrip view allows you to browse all of the ships that arrived in New York on a particular date. The Bark Harriet shown here only carried three passengers. The thumbnails in the filmstrip view for the ship Mediator show two pages of passenger listings for the Mediator and one page each for the Southerner and St. Helena. Obviously this is a small sample size but it is safe to say that experience of immigration in the 1830s was drastically different from immigration on the large steamships that arrived in New York at the turn of the twentieth century. For further background on locating immigrant ancestors, I recommend that you read this article from the Ancestry Learning Center by Juliana Smith: http://www.ancestry.com/cs/learning/identifying-immigrants. I hope you can make it to Austin in the last week of July but if not, please invite me to come to speak to your local genealogical society. You can contact me about any of your genealogical research and education needs by using the contact box in the right hand column of this blog. Scottish Marriage Records Reveal Family Secrets!